Groovy Gecko – Could Live Video Help us Better Communicate with Generation Z? Could Live Video Help us Better Communicate with Generation Z? According to Inc, 2019 will be the year Generation Z surpass Millennials as the largest generation, comprising about 32% of the population. Over the last decade or two, millennials have traditionally been the focus of most sales and marketing campaigns. That’s no surprise, given that their purchasing power is upwards of $200 billion, and up until recently they were the largest generation. But things are changing. Generation Z, loosely defined as the demographic born after 1996, is maturing, and as they do so are dictating the way brands and businesses position themselves. This is the generation that before making a purchase, will head to YouTube to watch a review from their favourite vloggers. This is the first so-called ‘technically-native’ generation, which has grown up using smart phones and tablets. Unlike their millennial siblings, many Gen Zs have never had to ‘learn’ how to use technology, it is simply the language with which they use to communicate. But there are many other generational quirks which make Gen Z a unique and challenging prospect for brands. Firstly, they have grown up to be wary of fake news, having been exposed to it from such a young age on social media. This generation has given itself the responsibility of being their own fact-checkers, but this has also fed into their perception of brands. As such, Gen Zs are sceptical of sales tactics and desire authenticity in the content they consume. Generation Z is also more concerned with the quality of interaction on social media, rather than the number of ‘friends’ they have. It is a generation, according to Inc, that is keen to develop ‘personal connections’. Some say that short attention spans are highly characteristic of this generation. This isn’t necessarily a negative, especially if it means they are better at multi-tasking, or making decisions quickly. But it does make it harder for brands to attract and keep audience attention, having said this, it could just be a reflection of a generation that is just more selective about which content deserves their attention, according to Wibbitz. This generation already spends a huge 10.6 hours engaging with online content daily. With so much content fired at consumers nowadays, and vast amounts of user-generated content on social media, it’s no surprise that Gen Zs are more selective about the content they give their time to. Video is now a pivotal tool, but pre-recorded video is just another piece of content to be scrolled past, offering few incentives to attract engagement. Live video, on the other hand, is much more effective and could be one of the most important tools to unlock the purchasing power of Generation Z. According to Marketing Tech News, Generation Z still respond strongly to branded content “as long as it ticks the boxes of being authentic, well designed and relevant”. As mentioned earlier, Gen Zs are calling out for authenticity, and live video can provide this. It’s a medium which appears much less mediated and staged, instead offering transparency and building trust in a brand. One of the key elements to driving engagement is to use our tools to make live video, especially on social media, highly interactive. With our Question Moderation tool, it’s possible for the audience to ask questions in the comment sections which can be fed to a host’s device and answered live. 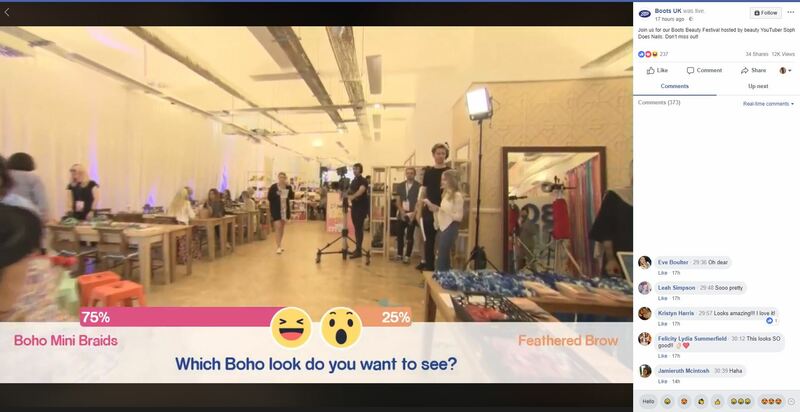 We can also poll the audience so they can change the outcomes of the live stream and even take part in complex interactions or competitions. Gen Z’s like to communicate through images. We now have endless visual methods with which to convey our emotions, from emojis and bitmojis to gifs, and as we have already mentioned, Facebook reaction buttons. The polling tool gives Gen Z viewers a sense of instant gratification, as the results of their vote affect the visual poll graphic instantly. And because it is such a visual tool, it particularly stands out to this generation. As there is a palpable reason to engage with the live video, and the results of which are easy to see, it is a much harder medium to ‘scroll’ past. It grabs attention, but most importantly keeps it. With so many different social platforms being used by Generation Z, it can be difficult to work out how to capture the right audience. The top five social platformsused by Gen Z are: YouTube (79%), Facebook (78%), Instagram (69%), Snapchat (68%) and Twitter (49%). With the ability to stream live to multiple platforms at once, it’s possible to boost engagement levels and reach more people in such a fragmented generation. In short, live video enables brands to hold a conversation with their audience and develop more meaningful relationships. When used correctly, it could help to meet the unique needs of Generation Z and help hold their attention. Like Millennials, Gen Zs want to make a difference in the world. Live video content, thanks to its interactivity, provides a real impetus for viewers to engage, and is exactly the marketing tool we need to reach out to what will soon be the biggest demographic on our planet.